Click on the picture to the right for the registration form!! Please come and join us for a fun-filled weekend on June 3rd, 4th, and 5th of this year for the 27th Annual PNKCA Convention, hosted by the Northwest Koi & Goldfish Club in beautiful Portland, Oregon. Our wonderful city has so much to offer that you will definitely want to come early and spend a few extra days enjoying the sites. You may wish to take in Portland’s Classical Chinese Garden, the world famous Japanese Garden, or the beautiful Columbia River Gorge, which are all within just minutes of the convention site. For those of you who would like more education on koi health, The Northwest Koi and Goldfish Club is hosting a wet lab on Friday, June 3rd. We are very fortunate to have at our wet lab three of the most knowledgeable speakers on koi health and water quality: Dr. Tim Miller-Morgan, Gary Jones of Aquarium Pharmaceuticals, and Spike Cover. This wet lab will be a must for any new hobbyist and a wonderful refresher lab for any advanced hobbyists, KHA’s or CKK’s that would like to be updated on microscope use, parasite identification, or any new medications/treatment protocols out there. For those who are not as interested in koi health, there will also be a bonsai workshop offered on Friday. Steve Wilcox of the Bonsai Society of Portland, will be teaching the concepts of planting, soil nutrition, root pruning and training a bonsai. This is a wonderful opportunity for anyone interested in bonsai, whether you are a beginner or a more advanced enthusiast. After the wet lab and bonsai workshop on Friday evening there will be a reception welcoming everyone to the PNKCA Convention. This is a fun time to meet new fellow hobbyists and visit with old friends in our wonderful hobby. 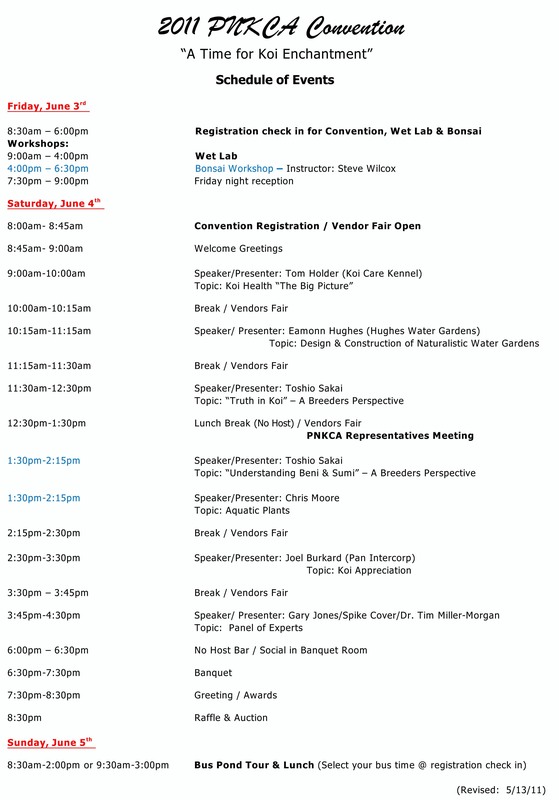 On Saturday, the day of the convention, we have arranged for an amazing host of speakers who will educate you on a wide variety of topics ranging from koi appreciation to water gardening. This year we have already confirmed an incredible list of speakers, Joel Burkard, Tom Holder, Toshio Sakai, Chris Moore and Eamonn Hughes. We are also fortunate to have many local vendors supporting our trade show this year and displaying many new products in the koi and water gardening industry. On Sunday, we have a fantastic pond tour scheduled for you with some of the most beautiful ponds in the Pacific Northwest. There will be a lunch provided at one of the ponds on the tour. So please mark your calendars for a weekend of education, good food, and lots of fun. Most of you know how much fun this annual convention is, but for those of you who have never attended a PNKCA Convention, you won’t want to miss this one! We are continually dealing with changes in our ponds and fish and how we deal with them seems to be changing almost on a daily basis. So it is really important that we share our knowledge and experiences with each other and the PNKCA Convention is a wonderful opportunity to do just that. And most of all it brings us all together to make new friendships and enjoy old ones. Hope to see you all for a fun and educational weekend at the Monarch Hotel on June 3rd, 4th, and 5th! ***Please remember that we really count on each club to donate a minimum of two items to the PNKCA Convention’s auction/raffle table.